Shortly after commencing, all HDR candidates will be provided with access to the full suite of Office 365 applications. This includes access to the current version of Outlook. To access these applications, you will be provided with a new HDR specific email address firstname.lastname@hdr.mq.edu.au. This is in addition to your (Gmail) student email address, @students.mq.edu. You will receive a notification email once your HDR email address has been established. A copy of your @student emails will then be automatically forwarded to your Office 365 account. As a result of the new forwarding set up in your Gmail account, any pre-existing forwarding requests will be over-ridden. If you would like to forward your student emails to a personal email account, you will need to set up a new forwarding request in your Office 365 account. Your @hdr email address will remain active until you cease enrolment as a HDR candidate. From that point onward your @student email address will continue and forwarding will stop. Once you have received access to your HDR email address, please check it regularly to ensure that you do not miss important correspondence from the University. All future correspondence from our office will be sent to your HDR email address. To access your email account in Office 365, please complete the following steps. 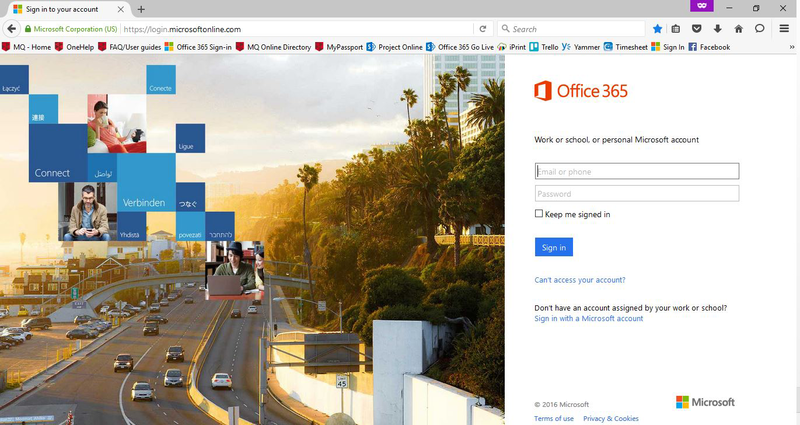 This link will take you to the Office 365 portal. For example, bonnie.nash4@hdr.mq.edu.au with student number 44556677 would have a password BoNa4455. Please note: Email addresses containing abbreviated names or initials are slightly different. For example, B.A.Nash@hdr.mq.edu.au with student number 45674567 would have password BaNa4567. 3. Once you log in using the above credentials for the first time, you will be prompted to change your password. Once these steps have been successfully completed, you should then have access to your Office 365 home page. To access your emails, click on the ‘Mail’ application. If you experience any difficulties accessing the Office 365 applications during your candidature, please contact the IT Service Desk on 02 9850 HELP (4357) or log a ticket via OneHelp.